Nightlife in London's Leicester Square is one of dozens of light installations on display around the city this week. The IFO (Identified Flying Object) installation looks like a massive birdcage and is located in the King's Cross area. Waterlicht by Daan Roosegaarde represents global warming and rising sea levels. Entre les Rangs by Rami Bebawi/KANVA uses reflectors to represent a wheat field. Origin of the World Bubble 2018 is located above Oxford Circus. Westminster Abbey in London is illuminated by a projection entitled The Light of the Spirit by Patrice Warrener during the Lumiere London festival on Wednesday. 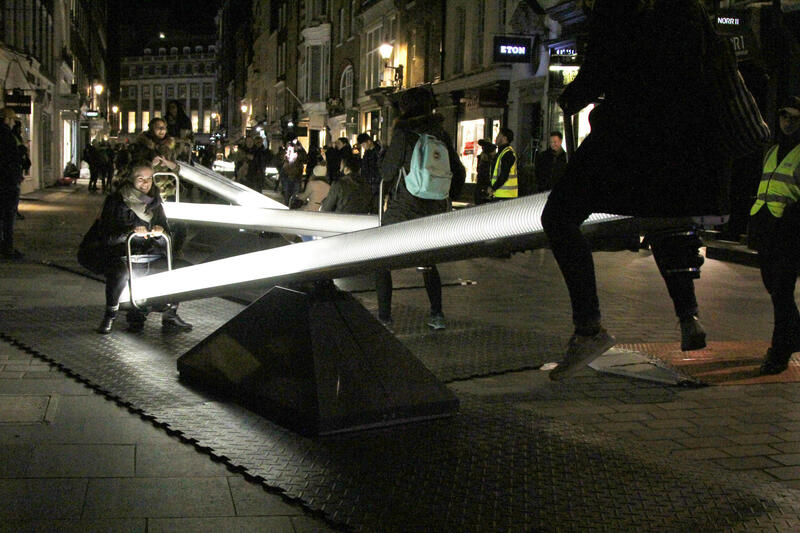 The Impulse installation allows people to sit on seesaws that light up. 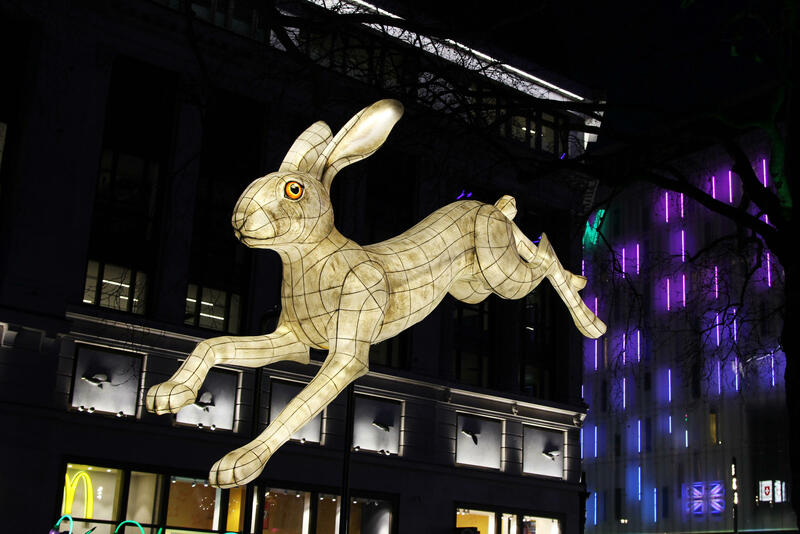 The Nightlife installation in Leicester Square includes moths, frogs and a rabbit. Winters in London can be damp and dreary. The British capital sits at 51.5 degrees latitude north – roughly equivalent to the Canadian city of Calgary – and in December, the British capital can descend into darkness by 4:30 p.m.
To provide some light and boost demand for London businesses, the city is sponsoring a four-day light festival that continues through Jan. 21. 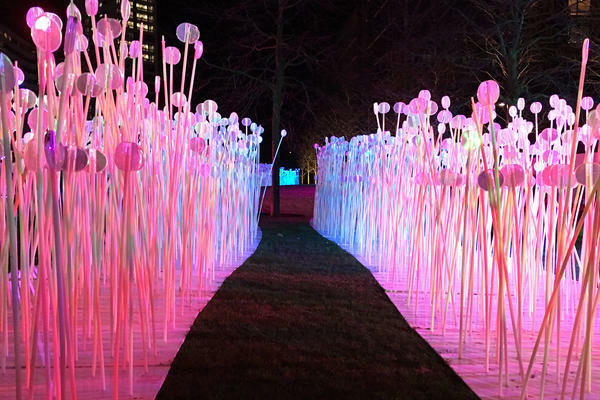 "Lumiere London" features more than 50 installations by artists from Europe and North America and is organized by Artichoke, a charity that produces art for public spaces. "Lumiere festival is fantastic, because it is the darkest time of the year," said Jo Pocock, artistic director of the Lantern Company, one of the participants. "It's a great way of bringing visitors to the city." And brighten spirits in the long, dark winter months. "It's harder to get up and that's why we need beauty," said Marie-Anne Souloumiac, who works for Studio Roosegaarde, a Dutch firm that created Waterlicht, an installation of undulating blue lights and smoke designed to resemble a flood. "It sparks up your imagination and that's what we need, especially in those dark days." London blocked off major streets, creating pedestrian-only zones for the exhibition. 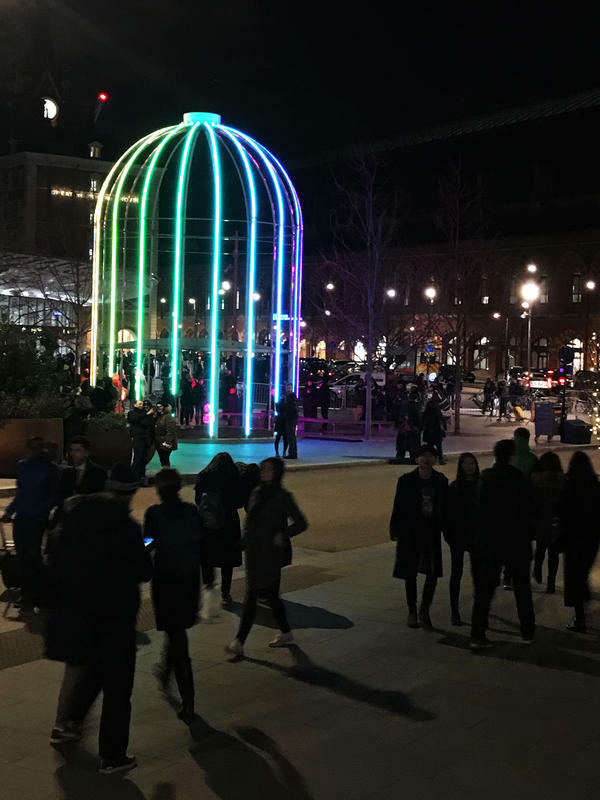 Thousands have flocked to installations scattered across some of the city's most famous areas, including Mayfair, King's Cross, the West End, Westminster and South Bank. 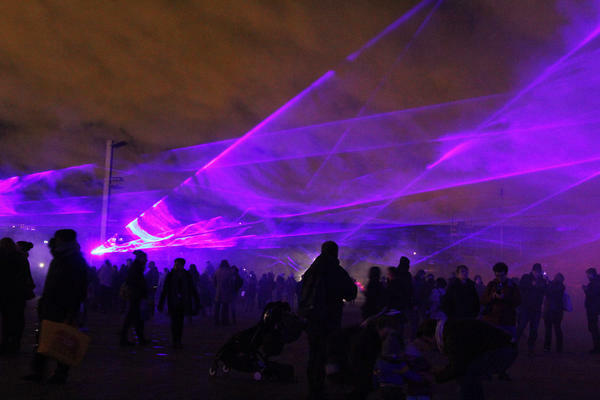 Waterlicht: Inspired by concerns about global warming and rising sea levels, this installation by Dutch artist Daan Roosegaarde creates a "virtual flood" of waves using blue light and smoke in Granary Square. It's next to a canal north of King's Cross rail station. Entre les Rangs: "Thousands of illuminated, flower-like reflectors" carpet a lawn north of King's Cross rail station and change color amid flashing blue, green and yellow lights. The installation by Rami Bebawi of Canada's KANVA architecture collective is "a tribute to fields of wheat that shimmer in the wind," says the installation's publicity material. 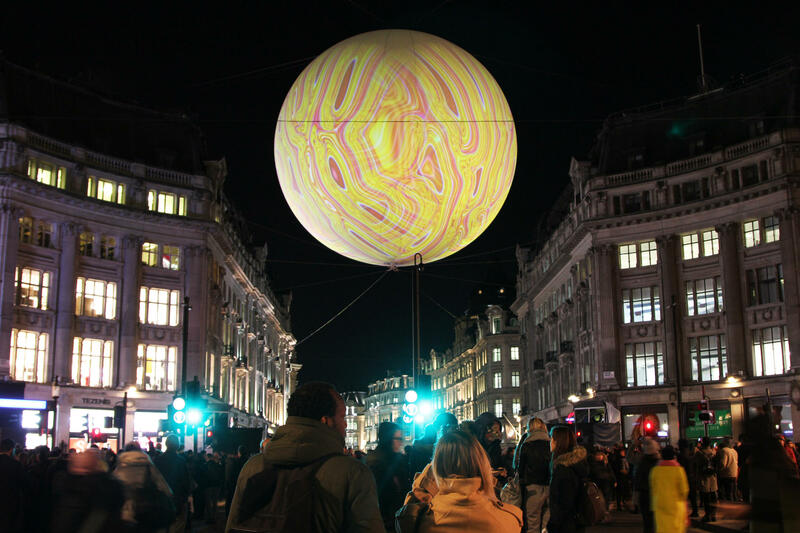 Origin of the World Bubble 2018: Four projectors beam images that mingle and change shape on a giant globe over Oxford Circus. The images are "inspired by the world of microbiology," 1970s psychedelia and the Op-Art movement. 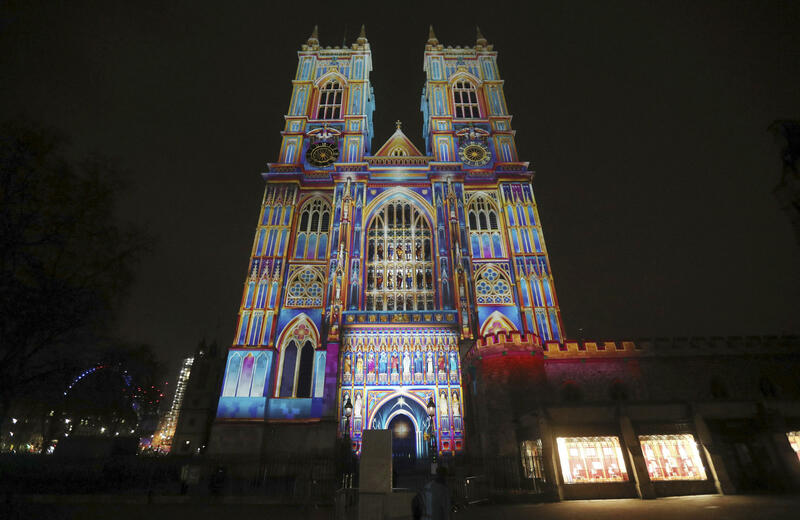 Light of the Spirit Chapter 2: Colored light projected onto Westminster Abbey creates the illusion of a painted facade and highlights the details of the Gothic church that dates to 1245. Impulse: People gravitate to these illuminated seesaws just off Oxford Street, which light up and make sounds when one side touches the ground. The installation by Canada's Lateral Office and CS Design group encourages people to play. Nightlife: In this installation, created by Pocock and her Lantern Company, an illuminated garden sprouts in the busy, urban space of Leicester Square with flowers, moths, a rabbit, a fox and frogs. NPR London producer Samuel Alwyine-Mosely contributed to this report.